Samsung Announces Unbreakable Display, Predecessor to Foldable; Challenge to Gorilla Glass? The US Occupational Safety & Health Administration, through Underwriter’s Laboratories, has given certification to a Samsung Display panel that the company cites as unbreakable. The panel is an OLED display produced on a flexible substrate, but does not use a Gorilla glass cover plate to protect the display. Instead, it uses a clear polyimide hardcoat layer. Samsung is now testing ways to laminate the hardcoat but has apparently settled on the PI from a Japanese company. We had previously cited Kolon (Korea) as in the running but they have not been selected. The display has been drop tested at 1.8 meters (above mil. spec) and repeatedly at 1.2m without breakage. The differentiating factor, according to Samsung, is the plastic cover material, which has a light transmittance and hardness comparable to glass, and is lighter in weight. The PI used in the display’s substrate actually has a yellow tint, but that is acceptable because the device is top emitting. Previous plastic cover lens have been lacking in clarity, with some casting a tint on the display as they age. Based on the approval, it would seem that Samsung Display is ready to produce such a display, which could be used for military as well as commercial applications. 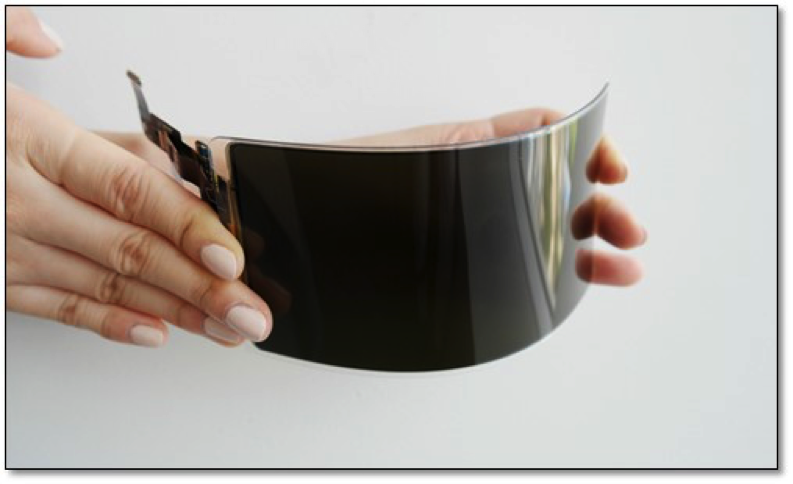 The hardcoat demonstrates that the cover lens for a foldable display is now possible. The next question is whether Samsung and others will widely adopt the new cover lens for all their smartphone panels, which would have a substantially negative effect on Gorilla Glass sales. Last week, we reported that Gorilla Glass 5 was introduced by Corning and survived face drops from between 1.6 and 1.8 meters onto 180-grit sandpaper, which replicates asphalt and concrete, similar to the drop test for PI.